Well, the autumn term is nearly upon me, but I did manage to escape to Oxford a couple of weeks ago to take part in Oxonmoot, Tolkien Society’s annual gathering that combines a conference, art exhibition, performances, etc. Oxonmoot has been held in Oxford every September since 1974, and this year’s event was hosted by St Antony’s College. I really enjoyed the diverse programme of papers and performances, the book stalls and the art room. And – of course – it was great to catch up with friends and colleagues (and some of my students!) over dinner or a pint at the college bar. This year I particularly enjoyed the papers by Jessica Yates on Tolkien and Shakespeare and by Denis Bridoux on resonances of Bram Stoker’s Dracula in Tolkien’s portrayal of Sauron. This Oxonmoot ended with a particularly moving Enyalië, a ceremony of ‘remembrance’ at Tolkien’s grave in Wolvercote Cemetery. 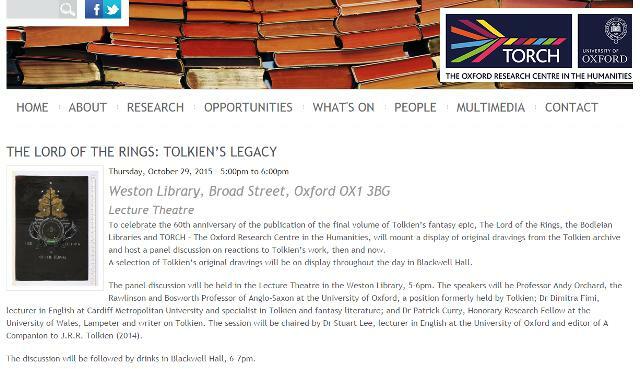 I will be in Oxford again on Thursday 29th October to take part in an event to celebrate 60 years from the publication of the third volume of The Lord of the Rings. To mark this anniversary, the Bodleian Libraries and The Oxford Research Centre in the Humanities, will mount a display of original drawings from the Tolkien archive and host a panel discussion on reactions to Tolkien’s work, then and now, on 29th October 2015. The panel discussion will be held in the Lecture Theatre in the Weston Library, 5-6pm. The speakers will be Professor Andy Orchard, the Rawlinson and Bosworth Professor of Anglo-Saxon at the University of Oxford, a position formerly held by Tolkien; Dr Patrick Curry, Honorary Research Fellow at the University of Wales, Lampeter and writer on Tolkien, and myself. The session will be chaired by Dr Stuart Lee, lecturer in English at the University of Oxford and editor of A Companion to J.R.R. Tolkien (2014). The discussion will be followed by drinks in Blackwell Hall, 6-7pm.